Are parents keeping up with their children’s dental health needs? The demands of modern society has made it extremely difficult to keep up with our kids’ dental health. We live in such a fast pace of motion that it can easily be missed if we’re not careful. With that said, the ADA is trying to help. 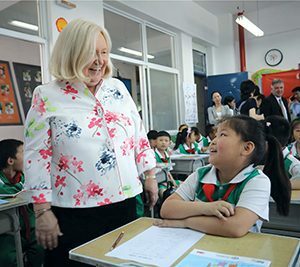 Here’s an amazing story about FDI President Dr. Kathryn Kell and how she has made it her mission to reach our kids about dental health. Dr. Kell, the ADA’s 10th District trustee from 2004-08, is in the middle of a two-year term as president of the FDI World Dental Federation, the principal representative body for more than 1 million dentists worldwide in more than 130 countries, including the U.S.
With FDI headquartered in Geneva, Switzerland, Dr. Kell has circumnavigated the globe several times since becoming FDI president in September 2017. “In May, I was home for only three days,” Dr. Kell said. In June and July alone, Dr. Kell traveled to Switzerland, China, Japan, Columbia, England and Minneapolis, speaking as a unified voice for dentistry in international advocacy and supporting member associations in global oral health promotion activities. In between, she is in the midst of planning two international events — FDI world congresses later this month in Buenos Aires and San Francisco next year. The latter will be conducted alongside the ADA 2019 – America’s Dental Meeting Sept. 5-9 in the Golden Gate City. Raising the visibility of the FDI — which in turns increases the organization’s leverage when it comes to advocacy and influence — is a major part of the president’s responsibilities, and Dr. Kell is happy to do it. She said she is constantly reminding members of national dental organizations, including the ADA, that if you are a member of your national association, you are automatically a member of the FDI. “I like to think of it as a part of the quad-partite,” Dr. Kell said, alluding to the ADA, state and local dental societies having a tripartite membership structure.